In addition to doing some fun/weird/useful/annoying things in Console applications, we can also set foreground and background colours. To set colours we use the Console.BackgroundColor and Console.ForegroundColor properties. When we set these properties we supply a ConsoleColor. 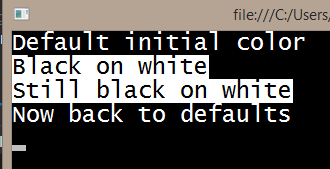 To reset the colours back to the defaults we can call the ResetColor() method.